Yesterday the latest flood forecast came out and boy was it specific. It was updated again today with even higher numbers given the rain we're getting though interestingly the prediction shows a slightly later surge of water than they thought yesterday. 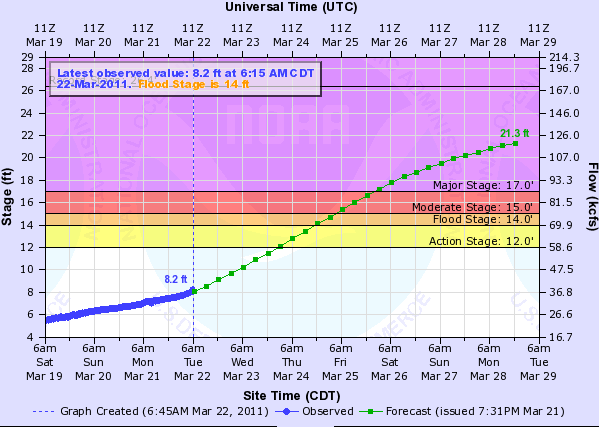 According to the graph, the Mississippi in St. Paul will officially reach flood stage at 7:00 PM on Thursday evening. This is a height of 14 feet. 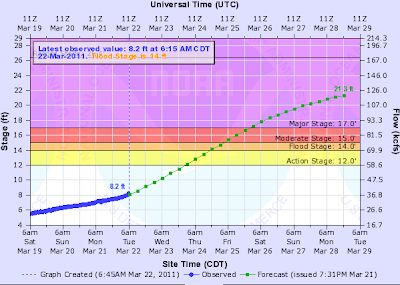 It will hit moderate flood stage less than 12 hours later at 7:00 pm Thursday. At 1:00 am Saturday it will have risen to 17 feet which is considered major flood stage. The highest value on the forecast thus far is 21.3 feet on Monday. We'll see what the rain and snow this week does to those numbers. They could still go up. For forecasts on other rivers see the Twin Cities Advanced Hydrologic Prediction Service website.